We were taking an afternoon boat cruise along the Rufiji River, when we spotted 2 Hooded Vultures perched near the Kidai Ranger Post. 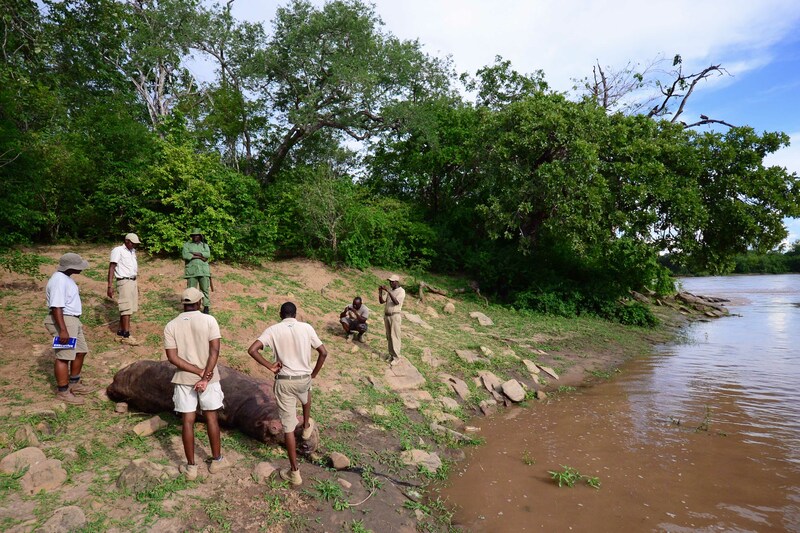 As we slowed to take a look we also spotted what was clearly a dead hippo right on the bank of the river, but fully exposed. We motored in towards the hippo and as we neared a large bull hippo snorted nearby and made a huge bow-wave as it moved away. Mindful that this large hippo was close, we carefully climbed off the boat onto the bank to take a look. It was injured and clearly killed in a fight within the last 12 hours or so. In many instances guides will take the easy route – park the boat, look and photograph from the boat, say a few words and then carry on the ‘planned’ boat safari. I always say that safaris plans WILL be changed by the animals everyday and you need to be able to let go of your plans if you want the safari to come alive. So, we went about piecing the story together. There were clearly teeth marks were the tusks of another bull had penetrated his skin. We felt the sparse hairs and thick blubbery skin and lips – things you could not dream of doing on a live hippo! We then looked around and followed the tracks (more like mass sand movement) – they went all the way up the bank and into the riverine bush. Here the bushes were broken and flattened and masses of soil had been moved during the battle. The smell and stain of blood was everywhere. With the vultures already seen and no crocodiles yet (though there are monsters in this river), we were able to piece the story together in a very real way and leave with a sense of what might happen at nightfall once we had all departed. Yes, you need to be in tune with your guests as not all will want such a real experience. But what a privilege to be able to share such a strong moment in the African bush with those guests that will respond.